Cambridge Audio has unleashed the world's first turntable to support AptX HD Bluetooth audio, meaning you no longer have to make a choice between listening to your beloved vinyls and experiencing cutting-edge audio quality. Launched at this year’s CES 2019 convention in Las Vegas, the Alva TT supports 24-bit/48kHz audio streaming over Bluetooth to compatible amplifiers, speakers, and headphones, so you can listen to your records wirelessly, and in stunning AptX HD. This should provide an sound quality that matches wired high-resolution audio, while retaining the uniquely warm sound of vinyl playback thanks to the built-in noise-reducing phonostage. The heritage British audio company says that the Alva TT, supplied with cartridge, will be available to buy from April 2019 for $1,700 (£1,500 / around AU$2,400). The high-output moving coil cartridge will also be available to purchase separately for $500 (£450 / around AU$715). By removing the need for wires, the new turntable should provide you with more options in terms of placement in your home than ever before, making listening to your records a totally seamless experience. The Alva TT also features a single piece tonearm, designed to reduced friction and deliver high levels of detail from your record collection. Sales of vinyl records have surged in recent years, reaching a record high last year, with over 7.6 million LPs sold in the US by July 2018. 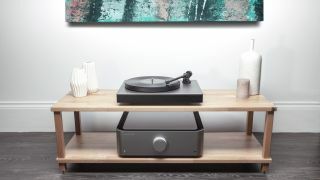 The spending figures proved vinyl revival naysayers wrong – and with innovative new gadgets like the Alva TT bridging the gap between old and new audio tech, it looks like now is a great time to invest in a new turntable.